The most basic type of interaction you can have on your website is getting information from your customers using a form. It may be for event registration, newsletter signup, or just a way for people to contact you. 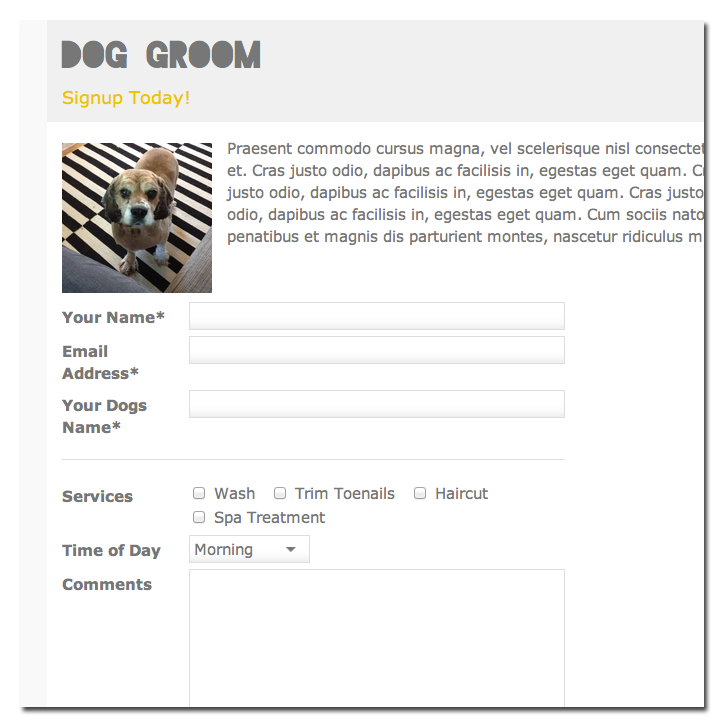 Doodlekit comes with a form builder that makes it super easy to make a custom form for your website. 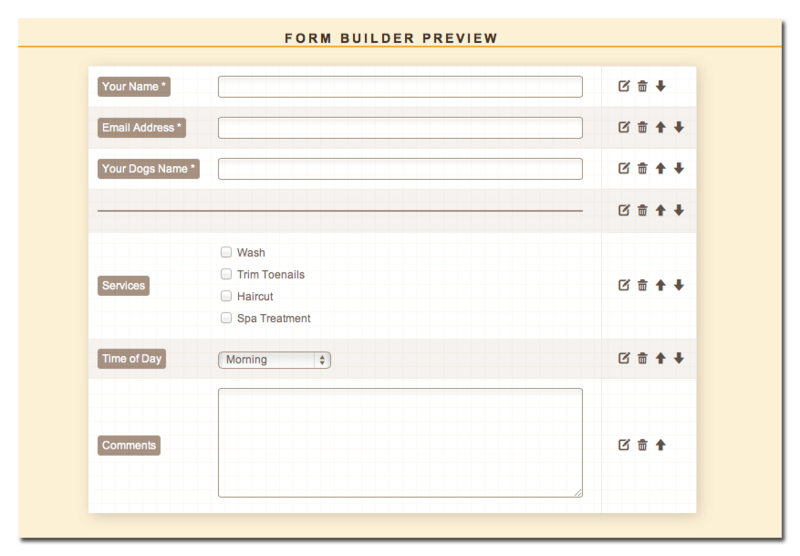 Our form builder allows you to create custom forms with standard controls like text fields, radio buttons and checkboxes. Visitors to your website can fill in the form and submission will be emailed to you. Submissions are also stored so you can later download all of them in CSV (Comma separated value) format. Forms are created like you create regular pages, by adding it to your menu. Clicking the "+ Form" button on the Pages admin page will bring up a Quick Edit window where you can begin to setup your new form. 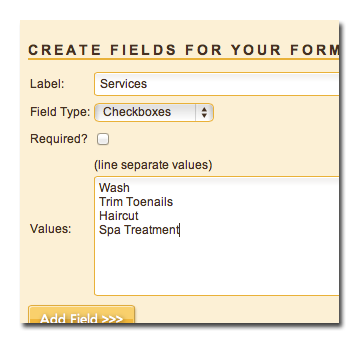 After providing the basic settings for your form, you can start adding fields to it. Fields are the heart of a form. Each field represents a piece of information you need from the visitor. Different types of fields allow you to capture information in different ways. 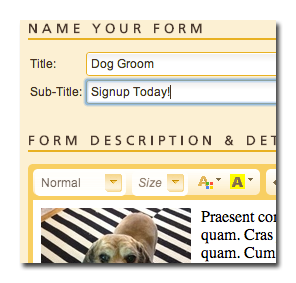 When you get to the form fields quick edit you'll see a small form that asks for a Label and Field Type. 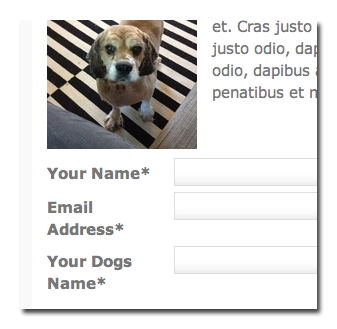 These fields allow the visitor to add any type of text. The Large field allows line breaks (Enter key) and the password field will obscure what's being typed. Each of these fields gives the user multiple choices that you provide. Drop Downs and radio buttons only allow one choice while check boxes allow multiple. You can enter the list of choices in the text area separated by line breaks. These are actually not fields, but allow you to add extra information about the fields between other fields. While this fields looks like just a regular Text Field, it's actually special. If the person submitting the form fills in the Email Address field, the email being sent to you with the form details will come "From" that email address. This makes it easy to reply for followups. 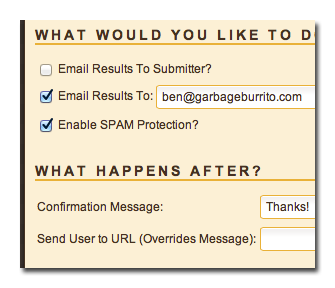 This is also used when you check the "Email Results to Submitter" check box in the advanced settings. After you add a field you'll see it below in the Form Preview area. Here you can see what the form fields will look like and edit, delete or re-order them.